Retail $46.00 SAVE 20% ! This is an amazing model kit and when put together with the allied accessory set it looks superb and could nOt get any better any way! Detailed suspension and chassis - includes engine, exhaust, & drivetrain. Exterior details include headlights, fuel tanks, winch, spare wheel, and simulated canvas cabin roof. "Fun model to put together"
Very detailed model. Pieces fit together very nicely. Lots of extras for added realism along with different configurations...so you can put together the same model multiple times and have a completely different vehicle. The only thing I have against it, and I have ran into the same problem with other Tamiya models, is that some of the parts are extremely delicate. So you have to be very careful when handling the sprues and removing these delicate parts for assembly or you can end up breaking them. Other than that I have no complaints. Building this model presented me with a few challenges overall the detail is excellent. the way the model came together as it was built was perfect had no issues with building or painting this model. 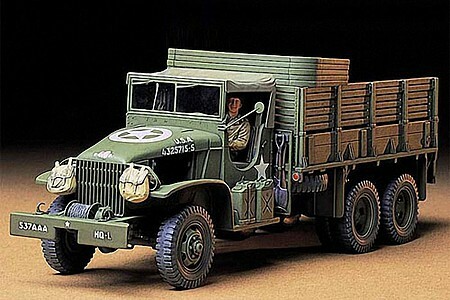 the best thing I can recomend is to buy two of these trucks and keep one the original, and add the 6x6 cargo truck accessory set to the other. Both truck are just superb. this is another quality kit from Tamiya.